At Caroline’s Cakes, we supply our homemade cakes, cookies and traybakes to both local businesses and personal customers across Leeds. 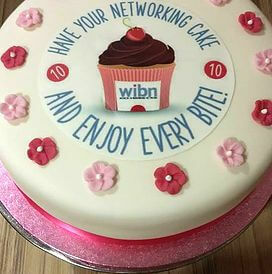 We’re delighted to be called upon to create cakes that make a lasting impression at a business meeting, or deliver something for a special occasion with family and friends. Our client base is ever-growing thanks to the kind words people say about us. As well as sampling our delicious bakes, take a look at our lovely testimonials to see why we’re so proud of what we do. Caroline provided a beautiful cake and it did taste delicious; feedback was excellent and it helped to make the whole event special. I would not hesitate to recommend Caroline for any celebration. An all male team I’d been working with had been a fantastic support and I wanted to show our appreciation. 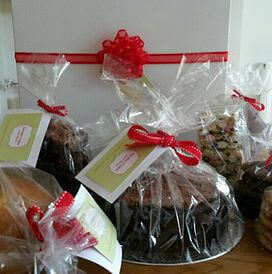 I knew that fussy cupcakes or lots of buttercream may not be their choice so Caroline of Caroline’s Cakes came up with a basket of goodies which included her famous Guinness Cake, rocky road tray bakes and oat and raisin cookies. All delivered to the centre of Leeds, in a short turnaround and a good price for the quality and quantity of goodies. By the Tweets that went out afterwards the Team were very happy, which makes me happy! 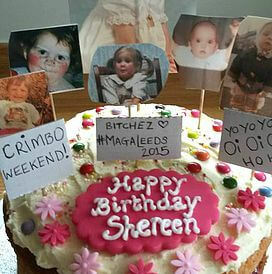 Thank you so, so much Caroline for the amazing cake for my friends on Friday! I was over the moon with it and my friends were really surprised and loved it. It just made our wee party that extra bit special. It tasted amazing! The birthday girl loved it ! Will definitely be seeing you again! 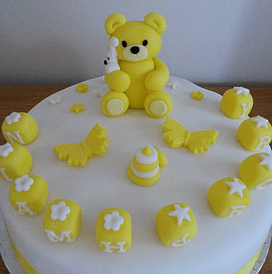 Thanks very much Caroline for making my daughter’s first birthday cake! It tasted gorgeous and I love the design. I will definitely order more cakes in the future.